“Some people build fences to keep people out, and other people build fences to keep people in.” That line, delivered by Troy Maxson’s (Denzel Washington) best friend, Jim Bono (Stephen Henderson), is the crux of the new stage-to-screen drama, Fences. Indeed, the entire narrative is an extended metaphor for the titular boundary and we rarely ever leave the Maxson property—one scene takes the action out into the street and it just feels awkward, like at any moment an ankle bracelet will start beeping, indicating that we’ve roamed too far from the house. Some individuals are admitted inside Troy’s home and others aren’t. Troy’s wife Rose (Viola Davis) is always welcomed into his home…and bedroom. His stepsons, Lyons (Russell Hornsby) and Cory (Jovan Adepo), are little more than mouths to feed to Troy (especially Lyons, who shows up every payday looking for a handout), and are tolerated more than accepted in Troy’s house. By contrast, Troy’s mentally challenged brother, Gabe (Mykelti Williamson), can waltz right into the house and grab something out of the refrigerator—ironically, an earlier scene shows Rose shooing Cory away from the very same fridge. The relationship between Troy and Gabe is similar, yet thankfully less tragic, than that of George and Lennie in John Steinbeck’s Of Mice and Men. Bono is always warmly received into Troy’s home, but is quick to vacate the premises whenever Troy gets sauced and launches into an anger-filled rant. Sadly, Troy goes outside of his fences for pleasure and brings a lovechild inside the walls of his house. One of the story’s ironies is that Troy raises Rose’s two sons from a previous marriage, but she raises his daughter from another woman. The ramifications of Troy’s extra-marital affair is that he is no longer honored or respected inside his own home by his jilted wife and estranged sons. Troy’s licentious behaviors also place a strain on his friendship with Bono…decisions have consequences. If Troy isn’t drinking or swearing, he’s talking about sports; baseball metaphors are like a second language to him. At one point, when Rose has had enough of Troy’s baseball analogies, she reminds him that this is real life, not baseball. But to Troy, life is baseball. It’s the only thing he ever excelled at, the only thing that ever fulfilled him in life aside from the bottle and his various trysts. An ongoing theme in the film, which is expressed through Troy’s self-pity and regret, is lateness. On several occasions, we’re told that Troy is too late, meaning he’s too old to play in the major leagues, which are finally starting to accept black athletes at this time (the 1950s). Troy might be too old to play professional baseball but he isn’t too old, as Rose is quick to point out, to go off philandering or to sire a child. 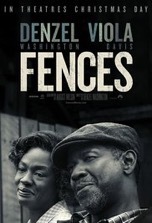 Although the fence analogy binds the movie’s narrative together, it’s August Wilson’s writing (based on his stage play), Washington’s directing and acting and the superb performances from the entire cast that makes Fences a noteworthy entertainment. Unfortunately, due to its long, chatty scenes, limited locations and claustrophobic settings, the movie never really breaks free from its theatrical moorings. If you can get past its sedentary staginess and its excessive use of the “N” word, Fences is a superb period piece that illuminates the struggles of one mid-century black family. The film is also a microcosm of the exigencies of the human condition—the challenges and successes that define us all, regardless of gender, race, religion or creed. Here’s a thought: Let’s tear down the fences and build bridges instead.